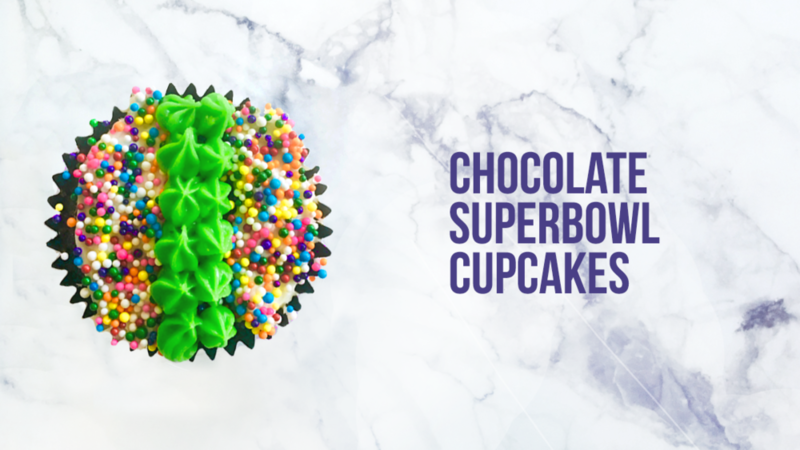 Are you looking for an awesome Superbowl cupcake recipe? Check out these delicious fluffy chocolate cupcakes with cream cheese frosting. Superbowl Sunday is almost here, so get the recipe below and watch the video for a full tutorial. I was inspired by some ideas I saw on Pinterest and wanted to give these stadium themed cupcakes a try with my own take on them. It’s a very minimalist overhead look at a stadium, with the field and the fans. There’s only so much you can do with the canvas being the size of a cupcake but even with that, I think these came out pretty good. The super fluffy and moist cupcakes are made from scratch and for the icing, I used store bought cream cheese frosting. In a large bowl, whisk together sugar, flour, cocoa powder, baking powder, baking soda, and salt. Stir in oil and milk, stirring until combined. Add hot water and stir until the mixture is evenly combined (it will be a thin batter. When you first add the water the batter will separate a bit, stir until it is even in texture. Batter will be thinner than a typical batter. Fill prepared muffin tin 2/3 of the way full and bake at 350F for 18-22 minutes (use the toothpick test to check). Use a knife to spread the white cream cheese frosting on the edges to create something for our little superbowl fans to stick to. Place the colored sprinkles on a plate and press the cupcakes into the sprinkles to add the “people”. Use the star tip to get a grass type effect for the “field” area in the center. So, that was it to make these chocolate cream cheese cupcakes, they are just perfect for a Superbowl party. Enjoy! Cupcake design idea inspired by Sprinkled With Jules.